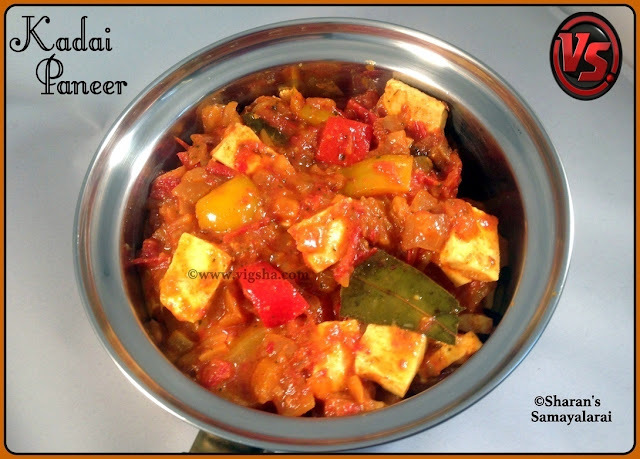 Kadai Paneer is one of the famous Punjabi bread accompaniment. It is a simple, spicy and fragrant recipe. You can make this either dry or semi gravy version depending on your choice. It tastes delicious in both ways, I am posting semi-dry version today. Check more paneer recipes which I have shared earlier :- Aloo Paneer Koftas, Palak Paneer, Paneer Tikka, Paneer Paratha, Paneer Butter Masala. 1). Cube paneer into bite size pieces and put them in hot water till use. This helps to keep the paneer soft. Keep aside. Cube onions and bell peppers, keep aside. Make sure to chop veggies to same size. 2). Heat oil in a pan, add cumin, cloves, bay leaf, cinnamon and saute till fragrant. Add onions, salt and saute till they turn translucent. Add Ginger garlic paste and saute till the raw smell goes and onions turn golden. 3). Add cubed tomatoes and saute till they become mushy. 4). Add turmeric powder, chilli powder and coriander powder and saute. Add 1 cup of water or as required to make gravy consistency. Cook till oil separates and then add capsicums and saute for a minute or two. Make sure not to change the color of capsicum and retain its crunchiness. 5). Drain paneer cubes from water and add it to the masala. Stir gently so paneer cubes do not break. Finally crush the kasoori methi within you palms and add that powder to the masala. Cook till the masala coats well with the paneer pieces. Switch off and garnish with coriander leaves. Serve hot with Coconut Milk Pulao (Thengai Paal Sadham) or Egg Fried Rice. # Make sure not to over cook the capsicum. It adds the texture and crunch to the dish. # I have used kashmiri red chilli powder, which is less spicy, but lends a bright red color. So adjust the spice levels to suit your taste. # The bright red color of the gravy comes from red tomatoes and dried red chilies. # Always use ripe tomato. Unripe and sour tomatoes makes tangy gravy. Or you can also use store bought puree (2tbsp) for bright color. # Do not over stir after adding paneer. Make sure not to break the paneer pieces.